I once been told by someone that wanted to justify his use of the whip, that a whip was like a gun; on their own they are harmless and it all have to do with how you use them. For a human that never seen a gun in person or on TV, never have been described one or read about it, a gun is a neutral stimulus; it’s a random object that do not produce any specific response. But if you were to demonstrate to this person how much damage a gun can do, then the gun would become a threat. Something interesting about whips is that once you have given them meaning, you don’t actually need to ‘use’ them much anymore. 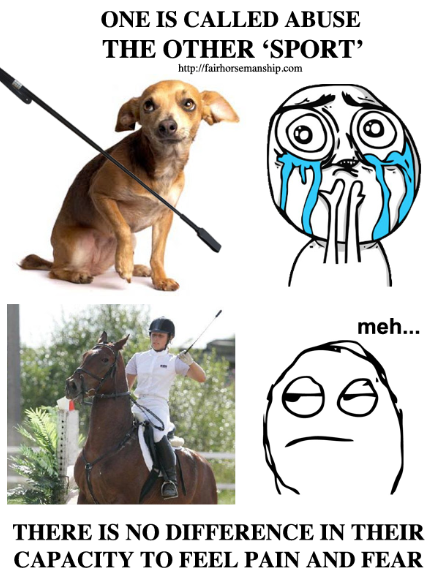 And this is especially true if you are one of theses professional equestrians that have mastered the beating of horses. I have seen in events and riding lessons people calling their trainers over, asking for a whip and actually not needing to beat the horse with it; the horse that was lethargic and tired all of the sudden started to move around a lot more quickly and nervously; the threat of pain is sometimes all you need. Robbers that take hostages or empty cash registers front of helpless shopkeepers could tell you all about it. For a long time I used whips with my horses to get more hind legs engagement or for lunging, yet since I had bought them I actually never beat them with it. I thought it was the ‘extension of my arm’ as people like to call it and because it worked and that I wasn’t actually beating them I thought it was fine. I failed to understand what was actually going on a psychological level; For the purpose of this explanation we are going to assume that the whip being hold by the owner/rider is a neutral stimulus. The whip is then paired with the pain of being beaten (unconditioned stimulus). As a result of the beating, the whip hold by the owner/rider becomes a conditioned stimulus that elicits fear (producing a conditioned emotional response). This is the principle of classical conditioning. One argument equestrians will come up with is that there is such a thing as ‘correct’ beating. People will even argue that there is some kind of ‘higher purpose’ to theses beatings and that it is somewhat beneficial to the horse. For example, one thing I was taught when I was younger is that it was more humane to whip the horse strongly once, than having to ‘kick him on’ constantly. But really why? Why was it so important for the horse to jump the oxer or canter on A? Do people realise that they are beating up a living, cognitive being on the grounds of entertainment? I could probably understand if it was a life or death situation, but just to win a ribbon? Just to have fun? Because your instructor tells you to do so? I don’t think there is a ‘correct’ way to cause mental distress and physical harm for the sake of pleasure. The next argument is probably that beating horses do not cause them any of the harm I claim. Because you know the horse is so big and his skin is so thick…. Mind you this is actually not true, especially where the whips land most frequently. For example, the thickness of the area of the muscle vastus lateralis rarely exceeds 2mm. Add to this that the skin dermis and epidermis is supplied with a large amount of nerves. 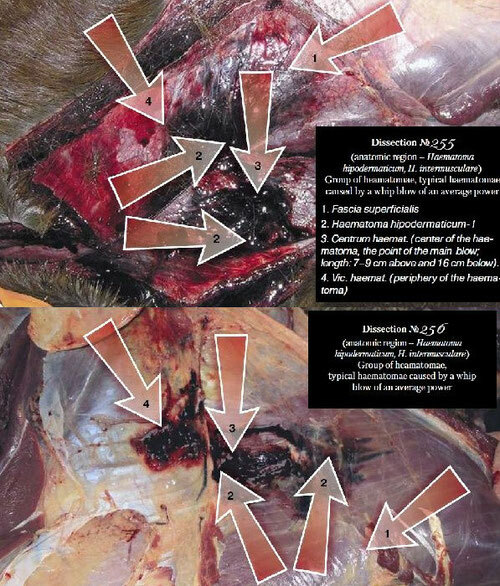 Dissections showing typical haematomas caused by an average whip blow. When vet pathologist Dr.Lydia Tong took a look at the difference between horse and human skin she found that the outer layer of the skin is thinner in horses than humans. In addition, she also found that horses have a higher density of nerve endings meaning they probably feel more pain than we do. Paul McGreevy, Professor of Animal Behaviour and Animal Welfare Science at University of Sydney, decided to find out whether having his leg struck with a racing whip, as hard as jockeys whip horses, would cause him pain and distress. The answer is a resounding “yes”, and the thermographic images he tooks clearly show heat at the site of impact. In the image below you can see white areas of inflammation in his upper leg 30 minutes after it was struck. McGreevy says: "My view is that – because there is no evidence to the contrary – we must assume that, just as I felt pain and distress from the impact of the padded whip, similar whipping in a horse would also cause pain and distress. Representatives from the racing industry will doubtless say horses have thick skin and are therefore immune to pain from whip impacts but there is actually no evidence of such pain resistance in horses. Indeed, horses can feel a fly on their skin such that it triggers a characteristic shake called the “panniculus reflex”."